Keep your plates off the floor and right where you need them with the CAP Barbell 2 inch Plate Rack. Made for either home or commercial use, this rack offers ample storage for 2-inch plates, keeping them off your floor and right where you need them. Constructed of heavy-gauge steel and powder coated, they look great and will last for years. CAP Barbell is a leading distributor and provider of fitness equipment. Launched in 1982 with a small inventory of free weights and benches, CAP Barbell has grown over the past 20+ years to include more than 600 products in 10 categories. Headquartered in Houston, Texas, CAP Barbell is dedicated to providing quality fitness equipment at competitive prices, by constructively designing, accurately testing, and manufacturing its products to perfection. Durable steel construction and powder-coat finish. Secure storage and organization of 2-inch plates. Keeps floor protected and plates handy. 500-pound weight capacity. Dimensions: 22L x 19W x 37H inches. Whether you are just starting your health journey with barbells or are already an experienced lifter, you probably utilize a variety of different plate sizes. Trying to find the correct size in an orderly fashion can be a pain - particularly if you share equipment and accessories with other people. Day 1 Fitness is pleased to offer our durable weight plate racks. Each rack can withstand up to 500 pounds and, with seven different branches, you ll be able to organize your plates so selection can be quick and easy. Able to hold any 2 inch Olympic weight plate (like any of the numerous ones Day 1 Fitness makes), the tree has a heavy-duty, powder-coated frame to resist scrapes and scratches. In addition, the rubber base will protect your floors from damage while offering compact storage for your crossfit equipment. Styled in a stylish black matte, it is well suited for personal use in a home gym or garage, as well as in a professional studio setting. We at Day 1 Fitness fully believe in providing premium equipment basics for all fitness and health goals, and these durable weight plate holders for storage and organization will ensure a smooth, seamless workout routine. 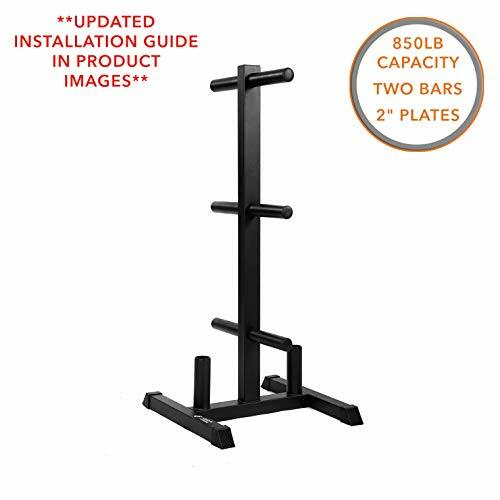 Size: 21.7" x 19" x 36.6"
Strong Weight Plate Tree: These weight racks from Day 1 Fitness are strong enough to support multiple size 2" plates with a max load of 500 pounds. The plate racks will maintain their integrity and support under extreme weight loads. Easy, Space-Saving Design: You will find no difficulty in either placing your various plate weights on the branches or removing them from the rack. The equipment accessory helps organize and protect your weights when not in use. Multiple Levels for Storage: With 7 branches featured on this triangular plate rack, avoiding mixing up the different size plates is convenient and simple, so you can save time mid-workout finding and racking the correct plates. Long-Lasting, Durable Finish: This Olympic plate tree has a powder-coated frame, which resists scratches, stains, and tarnish from even the heaviest and oldest equipment. The sleek black finish with round pegs allows for professional aesthetics. 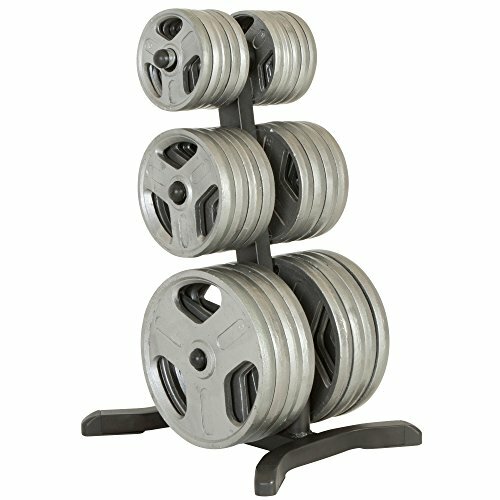 Great for Personal or Commercial Use: Besides providing the most effective way to keep your weights organized, our racks protect more than just your supplies. They feature a rubber base with rubber feet to prevent damage and scratches on your floors. Keep your plates stored and organized with the Fitness Reality X-Class Olympic Weight Tree. 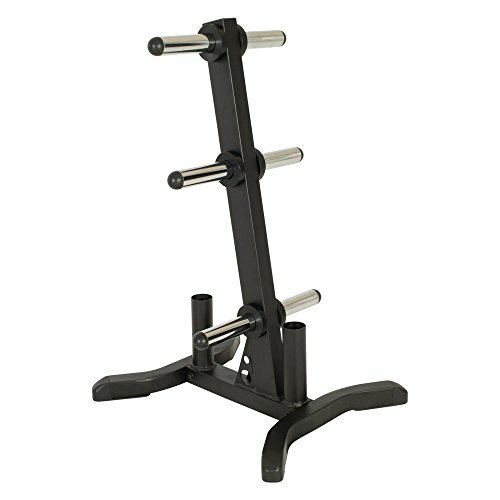 This weight tree is perfect for free-weight sets and benches, providing you with six storage posts that can support up to 1,000 lbs at a time. Additionally, the tree is designed to store up to two wide Olympic bars (weight plates and bars not included). The frame of the piece has a wide base and is constructed from chrome-finished powder-coated steel to prevent chipping and flaking. Dimensions: 26.5L x 22W x 41.5H in.. Powder-coated steel frame. Wide base for maximum stability. 6 storage posts. Supports up to 1,000 lbs!. Can hold 2 wide Olympic bars. Dimensions: 26.5L x 22W x 41.5H in. Supports up to 1,000 lbs! Please be aware of the products sold from unauthorized seller rather than ourselves(Yaheetech). We have never supplied or authorized for any other seller to sell this product in our brands name. They are selling fake and inferior products under our names. And please do report it for amazon if you had already bought from them. You will get your full refund and extra compensation. Sorry for the troubles. We are currently seeking legal advice on bringing them in to justice. 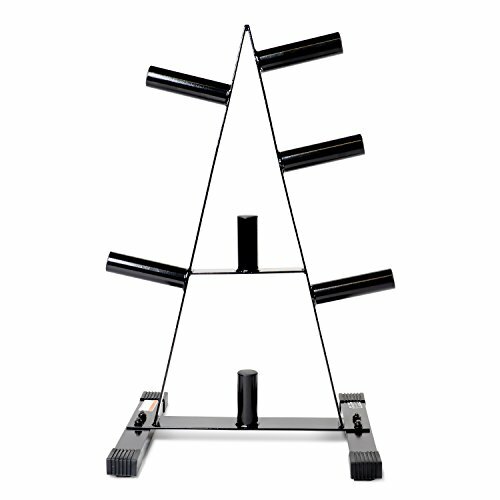 "Upgrade your training sessions in the comforts of a neat and tidy gym with the Marcy Standard Weight Plate Tree! Enjoy fat-burning and muscle-building exercises in an efficient home gym environment! If you re having trouble keeping all of your lifting plates in one place, then it s time to get this organizer. Perfect for your home gym use, this A frame plates rack makes organizing weights easy, so you focus on the heavy lifting and not the clean up afterwards! Built from high-quality steel, this weight storage accessory has a heavy-duty structure that effectively resists sweat and moisture, preventing rust buildup over time. 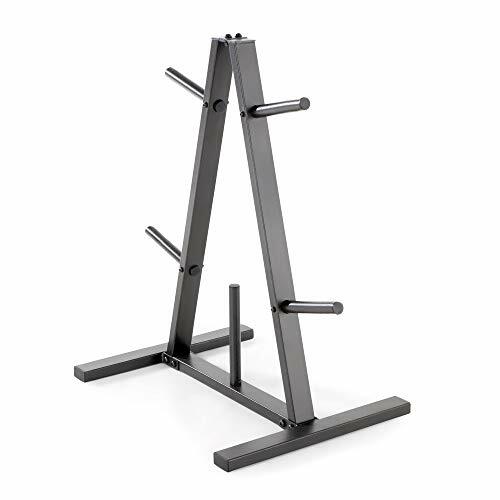 This home gym storage rack is built with heavy gauge steel tubing frame, and it has a maximum weight capacity of 300 pounds and is compatible with any 1 inch diameter Standard-sized plates. This strength training accessory is well built, sturdy, and allows you to develop a bulkier and more toned physique in record time. Maximize your purchase and get the perfect investment for your home gym with this package that comes with a two-year manufacturer s limited warranty. Managing space in your home gym will be as easy as your cooldown routine with this ultra-functional free weight organizer. 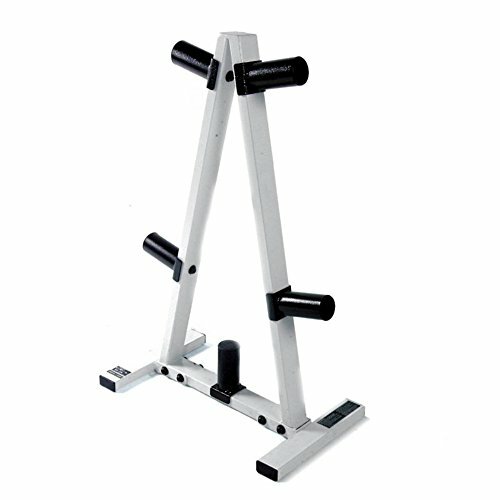 Get the Marcy Standard Weight Plate Tree PT-5733 and free up space while you enjoy workout out today! Organize your home gym - With 5 plate pegs, store your plates based on size; and it is compatible with any Standard Size weight plates with 1" diameter holes. Heavy duty construction - Built to facilitate efficient weight lifting, this weight rack is made with a high-quality steel, which effectively resists scratches and chipping, guaranteeing that it will last a long time. Compact and durable - This weight organizer has an assembled dimensions of 28 L x 18 W x 30.5 H, and it can store up to 300 pounds of free weights on the rack. Innovative layout - store your strength training plates in a designated space that allows easy access while keeping your home gym organized. 2-Year Manufacturer's Guarantee - Experience weightlifting workouts in the comfort of your home! This storage rack comes with a 2-year manufacturer's warranty to help maximize your purchase. 5 pegs allows ample storage. Holds Olympic 2" hole barbell and dumbbell plates. Keep plates handy and enjoy the sturdy functionality of the CAP Barbell Black/White 2 inch Plate Rack. Made for either home or commercial use, this rack offers ample storage for 2-inch plates, keeping them off your floor and right where you need them. Constructed of heavy-gauge steel and powder coated in black and white, they look great and will last for years. CAP Barbell is a leading distributor and provider of fitness equipment. Launched in 1982 with a small inventory of free weights and benches, CAP Barbell has grown over the past 20+ years to include more than 600 products in 10 categories. Headquartered in Houston, Texas, CAP Barbell is dedicated to providing quality fitness equipment at competitive prices, by constructively designing, accurately testing, and manufacturing its products to perfection. Durable steel construction and powder-coat finish. Secure storage and organization of 2-inch plates. Keeps floor protected and plates handy. 300-pound weight capacity. Dimensions: 20L x 12W x 30H inches. Whether you are just beginning your fitness journey, are a weekend warrior, or are an experienced, serious lifter - you probably understand the importance of having a variety of weights and supplies. Furthermore, you are probably all too familiar with the clutter that can occur when you have invested in mats, hand weights, medicine balls, exercise bands, and so much more! Day 1 Fitness has the perfect solution - at least for a lot of that clutter. 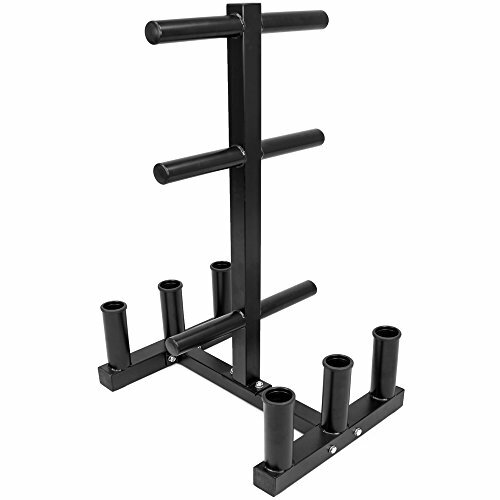 Our 6-pegged, double bar stand takes up very little room in any room and offers plenty of space for organizing your olympic plated weights, barbells, and other miscellaneous workout gear. Brandishing superior strength and durability, each rack can hold up to 850 pounds and is powdered coated to protect its integrity. Furthermore, the bottom of the Olympic weight tree is made of rubber to protect floors, offering additional sturdiness. We at Day 1 Fitness fully believe in providing premium equipment for all fitness and health goals, and these durable weight plate racks for storage and organization will aid in encouraging a fun journey. Size: 24.9" x 23.6" x 51.4"
PLEASE NOTE THAT THE USER GUIDE HAS BEEN UPDATED: SEE USER GUIDE ATTACHED IN PRODUCT DETAILS SECTION OR IN IMAGE 7. 30 DAY MONEY BACK RETURN THROUGH AMAZON. Handsome Look: The Day 1 Fitness gym weight trees consist of a protective, powder-coating which helps resist scratches, stains and tarnish even after significant wear-and-tear. The sleek black finish offers a professional, clean feel in any space. 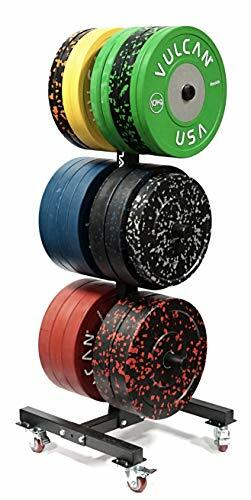 Multipurpose Organization: Each weight tree has 6 pegs for any 2 Olympic bumper plates, so you can organize all your weights easily. Additionally, the 2 bar holders on the base will stand your barbells upright to store them off of the floor. 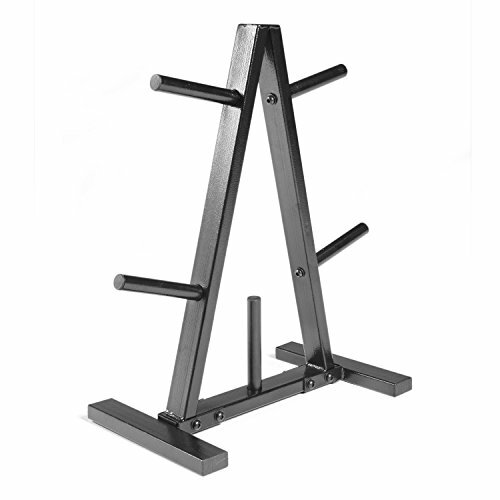 Secure Weight Stand: In addition to rubber feet to protect floors and reduce shock when restocking, the pegs let plates slide on and off easily, so you won't have any hassle. The rack is stable so that any weight imbalance will not cause it to tip. Compact Storage: Standing at a little over 4.25-feet high, with a 2-foot width, these Olympic weight trees will not take up much space in your home gym, whether in your garage or basement. They give you as much space as you need. 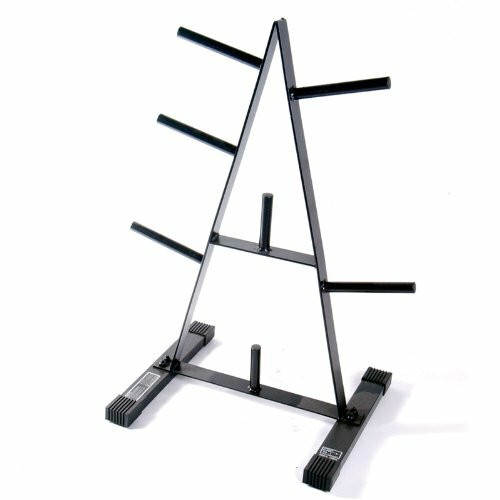 Olympic Weight Tree and Bar Rack Keep your workout area safe, clean and organized with this Olympic Weight Tree & Bar Rack from Body Solid. Six 2" x 8" weight plate storage posts keep plates safely suspended off the floor for easy storage and removal and can hold up to 1,000 lbs. of weight. Two Olympic bar holders store all styles of Olympic bars. Designed with central weight load distribution that virtually eliminates the risk of tipping. Features heavy duty 2" x 2" and 2" x 3" high tensile strength steel with all 4 side welded construction and finished with ultra tough electrostatically applied powder coat finish. Weight plates and bars optional. 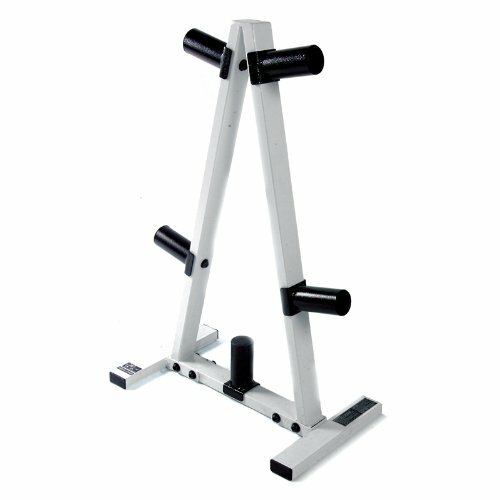 Keep your workout area safe, clean, and organized with the Body Solid GOWT Olympic weight tree and bar rack. Outfitted with six 2-by-8-inch weight storage posts, the rack can hold up to 1,000 pounds of weight in several configurations, including a series of 45-, 35-, 25-, 10-, 5-, and 2.5-pound weights. More importantly, the storage posts keep the plates safely suspended off the floor for easy storage and removal--just slip on the weights after you're done and you'll keep your workout room uncluttered. The rack also offers space to store a pair of Olympic bar holders, and includes a central weight-load distribution system that virtually eliminates the risk of tipping. Made of high-tensile-strength steel with all-four-side welded construction and finished with ultra-tough, electrostatically applied powder coat finish, the GOWT measures 23 by 40 by 20 inches (W x H x D) and carries a lifetime warranty. The weight plates and bars are sold separately. 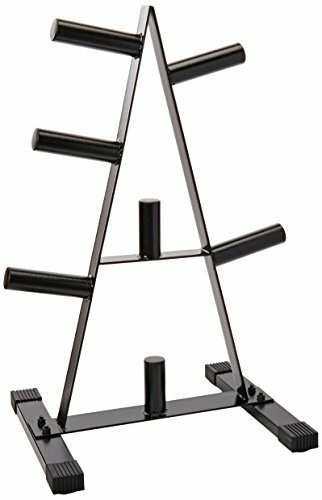 Vulcan Strength Training Systems Olympic Bumper Plate Tree for Weights | Weight Storage Rack w/Wheels. Perfect for any commercial gym, athletic performance facility, personal training studio, fitness training center, or home gym. 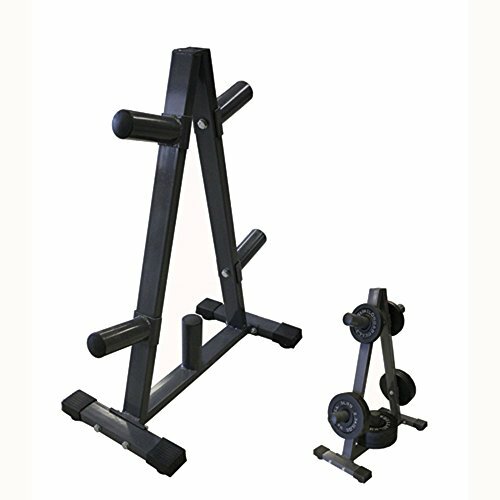 This is a sturdy and stable design that allows storage of several hundred pounds of bumper plates or cast iron Olympic plates. If your gym is unorganized or squeezed for space, you need an Olympic Bumper Plate Tree for Weights. Get those plates off the floor! Organize Your Home Gym With 6 Plate Pegs, Store your Plates Based on Size and it is Compatible with any Olympic Weight Plates with 2" Diameter Holes. Convenience Have a Capacity to Store Heavy Olympic Bumper Plates in one Convenient Space-Saving Area. 11.5 of Loadable Sleeve per Post. Portable This Home Gym Accessory comes with Transport Wheels at the Bottom of the Unit Which make it easy to Transport the Plate Tree as Needed. Functional Protect Floors from Damage and Keep your Workout Area Organized and Safe by Easily Storing Standard Plates off the Ground. Perfect For Any Commercial Gym, Athletic Performance Facility, Personal Training Studio, Fitness Training Center, or Home Gym. Keep your plates off the floor and right where you need them with the CAP Barbell 2-inch Plate Rack. Made for either home or commercial use, this rack offers ample storage for 2-inch plates, keeping them off your floor and right where you need them. Constructed of heavy-gauge steel and powder coated, they look great and will last for years. The durable steel construction and powder-coat finish make this plate rack a reliable storage space for Olympic Plates. Securely store and organize various sizes of weights with the SEVEN different plate posts. This plate rack has a 500-pound weight capacity. CAP Barbell is a leading distributor and provider of fitness equipment. Launched in 1982 with a small inventory of free weights and benches, CAP Barbell has grown over the past 30 years to include more than 700 products in 10 categories. Dimensions: 22L x 19W x 37H inches. TRUST - CAP has been a pioneer in the fitness industry with over 30-years of experience and locations worldwide. Chances are, if you have ever worked out before, you have used a CAP product. Keep your weight plates in order and off the floor with the CAP Barbell 1-inch plate rack. This rack features a durable steel construction and accommodates 1-inch plates. It also features a black powder-coat finish and triangular design. Ideal for home use to keep your workout space organized and your plates readily available. Steel construction offers outstanding durability. Keep floor protected and organize weights. Accommodates 1-inch plates. #CONSTRUCTION - Durable steel construction with five posts to store standard plates with a 1-inch center hole. Maximum weight capacity of 300 pounds. The assembled dimensions of this rack are 23.5" Length x 12" Width x 25.5" Height. 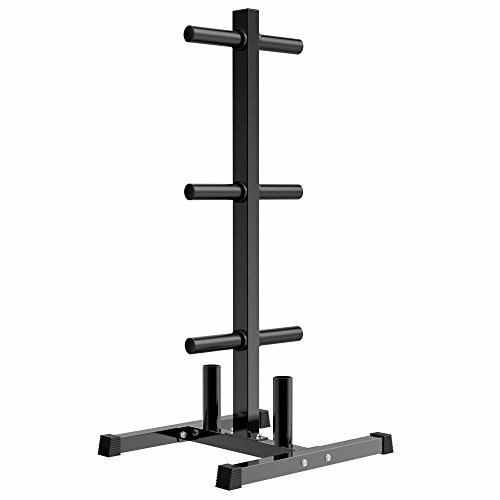 #FEATURES - Black powder coat finish & steel construction offers a durable, sturdy rack for your weights. The triangular design allows maximum weights to be stored in a smaller space. Five posts allow multiple areas for different sized weights. #FUNCTIONAL - Protect floors from damage and keep your workout area organized and safe by easily storing standard plates off the ground. #TRUST - Trust experience. CAP has been a pioneer in the fitness industry for over 30 years and has locations worldwide. Chances are if you've ever workout out before, you have used a CAP product. 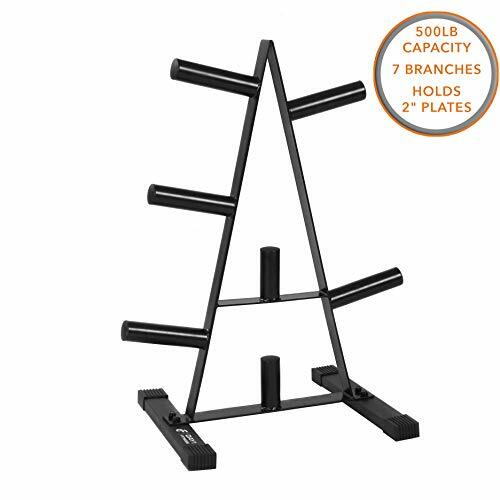 The CAP Barbell 1-Inch Standard Plate Rack is made of durable steel construction and has an A frame design to provide easy and convenient storage for standard weight plates with a 1-inch center hole. Protect floors and fitness equipment with this economical plate rack, which is ideal for home use. With a weight capacity of 500-pounds, this plate rack was built for long-lasting performance. 30-day manufacturer s warranty. *Please refer to CAP s warranty policy to understand what is and is not covered under warranty. -----High-elastic foam liner, not deformed, thickened design, more comfortable to use. Avoiding the pressure on your body - Our unique cut away design helps to avoid unwanted pressure on the neck, spine or groin and allows us to add more protection to the places that need them. -----Buffer shoulder pressure, the effective protection of the shoulder, neck and chest. Reduce discomfort and avoid hurting - Our Barbell Squat Pad reduces discomfort to allow you to workout longer, and with more weight- increasing your gains! -----Allows for proper form of squats and lunges with comfort. Has a 1.3 thick protective layer for added comfort. Doesn't deform or lose shape after repeated use. -----Middle groove design, more suitable for neck, the neck more comfortable. 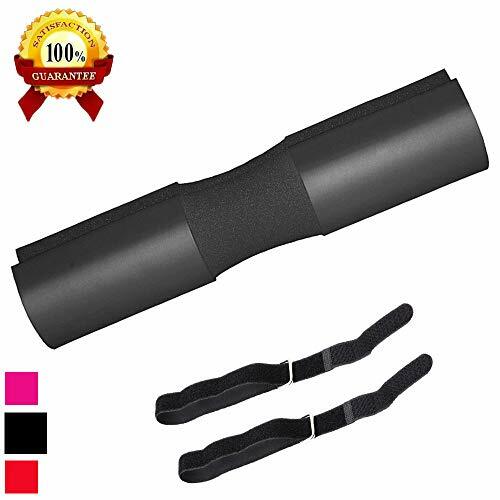 -----For fitness barbell weight groups.Using conveniently - Quickly install or remove the Barbell pad in the blink of an eye, but remain securely fastened during lifts. 1x Barbell Pad 2x straps for extra safety. SQUAT WITH COMFORT WITHOUT PAIN:Our Ergonomic barbell squat pad design for even weight distribution across the shoulders, Creates a cushion for your neck .relieving neck pressure while squatting. The Advanced Squat Pad allows you to focus on your form without pain. PERECT SIZE 17.7 LENGTH 3.9WIDTH, great for both standard and Olympic bars.Our barbell pad help you focus and push the limits, fits most of sizes bars. Extra thick foam, IADU men and women's squat barbell pad has 1.3 protective layer with a non-slip surface and will last longer.In the same time protect the neck and shoulder from the rough knurling on weight lifting bars, stops cuts grazes and improves squatting comfort. PACK WITH 2 METAL D RING VELCRO STRAPS,DOUBLE SKID RESISTANCE. IADU squat barbell pad with 2 fasteners ensuring squat pads will not slip or rotate when in use for safe squats and exercises. More safe to challenge your limits. Quick-Slip design for easy and fast installation on any barbell. Fits any bar without movement. Just clip the bar pad on the bar and start exercising! Made from high-quality,high-density, soft thick foam to increased comfortable and durability. It was made of multiple open and close cell foam, absorbing all shocks to increase comfort and reduce injury. Super soft and anti slip,provide a good balance when squat.It won't be deformed after repeated use for many times.And you could lift more weights without pain too.Our squat barbell padding which is safer around your body,Prevent bruises, redness and discomfort. CONVENIENCE AND USEFUL. Lightweight and portable design that you can carry it to gym or any other place easily.Our barbell pad will help you gain the most from your training.Whether your goals are strength, health,fitness or just purely aesthetic. This pad for barbell will developing your lean muscles and toning your glutes and legs.A good helper for squat,hip thrusts and lunges. Guarantee:We provide 3 months 100% money back without any questions if you don't want to keep our Barbell Squat Pad. 1000 lbs of real weight plate capacity. 2" x 3" powder coated steel frame construction. 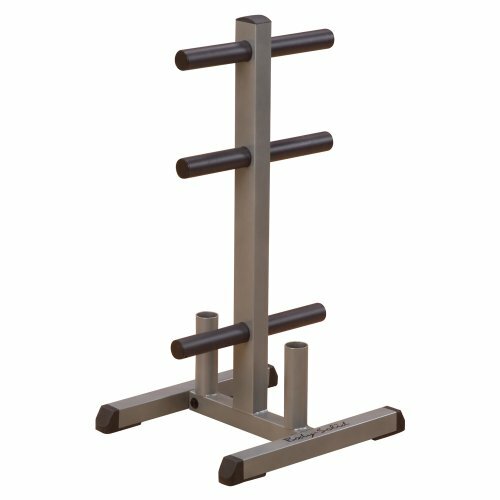 CAP Barbell Olympic Plate Rack, 2"
Olympic 2 Hole Plate Tree uses heavy gauge steel and precision craftsmanship to design this space saving rack. This plate tree keeps plates safely suspended off the floor for easy storage and removal. Warning: This product contains one or more phthalate chemicals known to the state of California to cause birth defects and other reproductive harm. Consumer may return the product for a full refund, including shipping cost for both receipt and return of the product within 15 days of his or her receipt.